A truly classic chain of understated beauty that can be worn with jeans or your best dress. I start with a large 12 ga. sequential link in the center and add 14 ga. sequential links on either side, then 16 ga. sequential links and finish the chain with several inches of 18 ga. sequential links to the desired length. This one measures 18" long and the center link is 1/2" wide. The organic pendant is made from melted scrap sterling that I have rolled into a flat freeform shape and then bezel set an amazing dichroic glass cabochon on it. For the chain, I've reticulated the silver to give it the texture that you see and soldered on the rings for attaching to each other. The color in this cab is not shown well in this photo as it changes when it's moved, there is more aqua than visible here. I can make this pendant with your choice of stones or glass cabs. Pendant measures 2-3/4" across at the widest and 1-1/2" high. 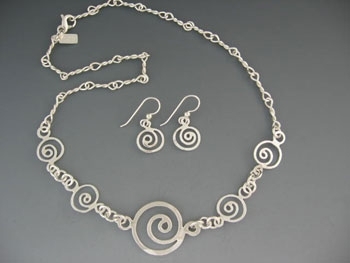 The entire necklace is 18-1/2" long and the earrings measure 2" long including the earhook. 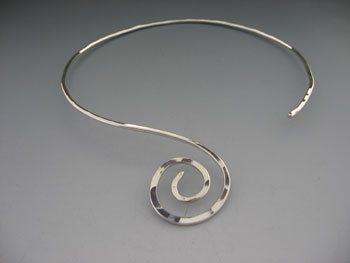 The swirl collar is easy to wear, so comfortable and light yet it makes quite a statement. I've used my planishing hammer to create the faceting that you see on the surface. Swirl measures about 1-1/4" wide and the inside diameter is about 5-1/2". This graceful chain moves with you in a fluid motion, it's like wearing a piece of liquid sculpture. The width is 1/4" and the length measures about 24" allowing the chain to slip over your head. The clasp has been eliminated to maintain the spiral. 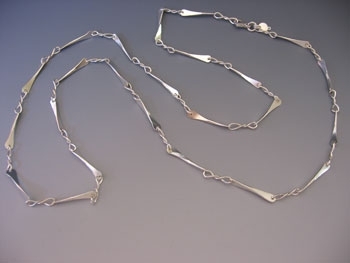 This sparkling sterling silver hand made chain has lots of movement and catches the light even when you are still. One of the most attention getting chains I make! Delicate twisted links and tiny spirals are joined to form a light chain. I've been told that the spiral is a powerful symbol of healing. I do know that it appeals to many people for many reasons. The chain measures about 17-18". This light and sparkly chain is made from 3 sizes of hoops each made from a different gauge wire. The hoops are soldered together and then carefully faceted with a hammer to make it shimmer as you move. Definitely the most popular chain that I sell. This one measures 18" long and has a lobster clasp. 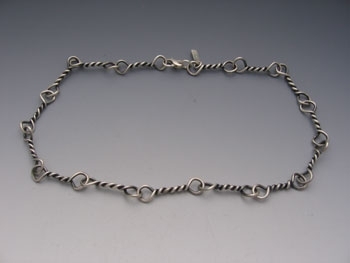 Made by hammering round wire flat on either end and drilling a hole to accommodate the silver ring that is inserted and then twisted to join them. This is a sparkly and elegant chain equally beautiful with or without a pendant. Measures 35" long with a lobster clasp. This delicate pine cone design is hand sawn from a piece of sterling sheet, then I solder another sheet behind it for strength. Please note that each pine cone design will vary slightly. 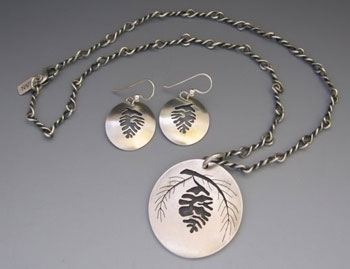 The earrings are made in the same manner without the added weight of the sheet soldered behind it. The earrings are about 1/2", and the pendant is about 1". 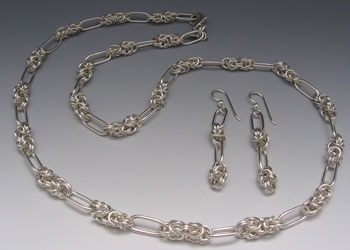 This set includes a 17" oxidized twisted link chain. 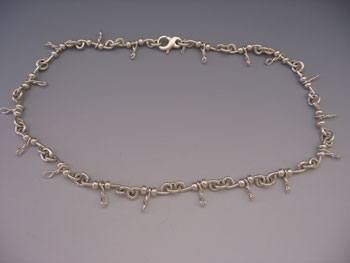 The longer twisted links in this necklace give it a distinctive look, then the oxidizing really makes it stand out. It is my son Josh's design. It looks best worn without a pendant. Measures 19" long with a lobster clasp. A small, more delicate version of the chain that I have worn daily for the last few years. I've oxidized it and joined each oval link with a small jumpring. 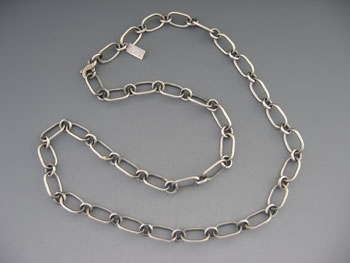 This chain measures 20" long and about 1/4" wide. Makes a nice bracelet also and of course can be ordered in any length. $150 for this length, includes postage and tax. A bow knot is made by wrapping oval loops with ultra fine wire in the center forming tiny bows. Each bow knot is joined by a jump ring making an intricate chain. Measures 21" long. 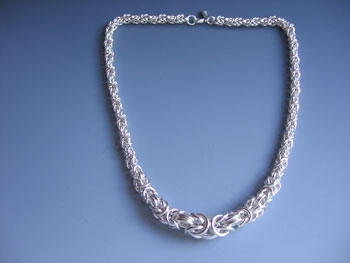 This fine twisted link chain has a center section of sequential chain, an ideal necklace for people that prefer a more delicate looking chain at an affordable price. 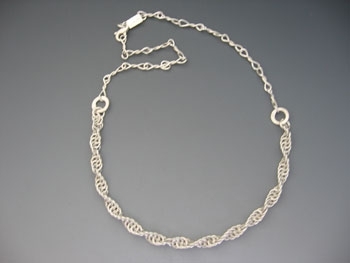 May be ordered any length, this one is 16" and the chain can be oxidized as this one is or shiny. $160. including postage and tax. 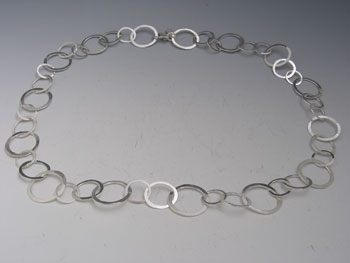 A very beautiful medium weight chain made by connecting sequential links with sterling rings pulled into ovals. The earrings are shown quite long but can be ordered shorter if you like. 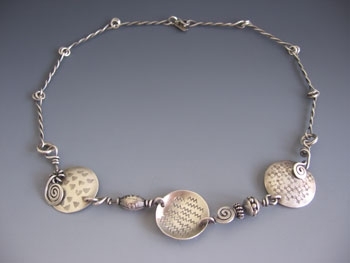 Each sterling silver disc is textured with various stamps and domed either convex or concave. Then the fun begins when I design some really interesting connections for the conchos. 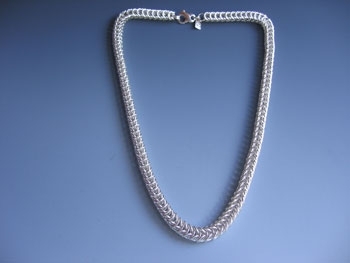 No two chains are alike and this one is already sold but it gives you an idea of what is possible. Measures about 18" long. A light, shimmery chain with lots of movement. Appropriate for dress up as well as casual occasions. 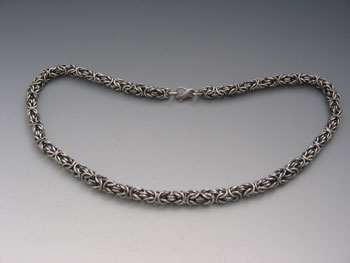 The length of this necklace is about 18". 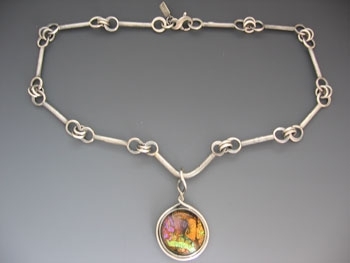 Shown with a dichroic wrap pendant. 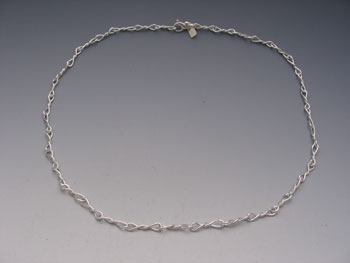 Love the texture on this reticulated bar chain, the bars are connected with rings and can be made any length. The pendant would have to have a large loop in order to fit on this chain, the wrap pendant works best. Chain length is about 18". The S hook chain is very lacy. Here it is combined with a few simple jumprings in between each S hook to create a delicate chain with lots of flash. Measures 20" long and includes a lobster clasp. 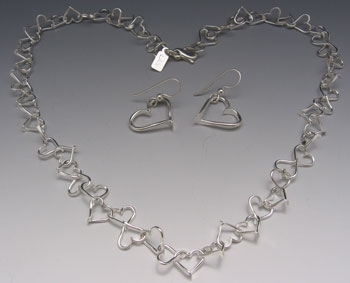 Each heart is hammered, shaped and soldered together to make this unique 18" chain for someone very special, add the large heart earrings to complete the set. 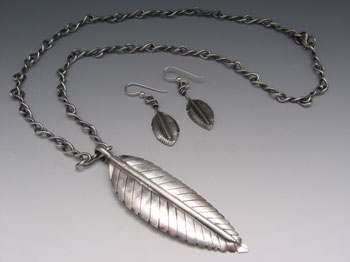 I've made a graceful feather pendant and suspended it from a medium weight twisted link chain and added matching feather earrings to complete the nature lover's set. May be sold separately also. 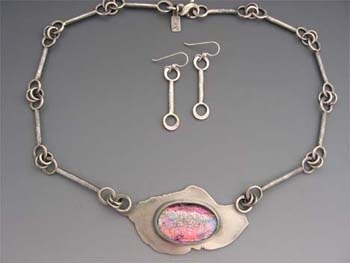 All the pieces have been oxidized to highlight the details. Made by soldering sterling silver rings together to make a chain and then twisting them into tiny links. 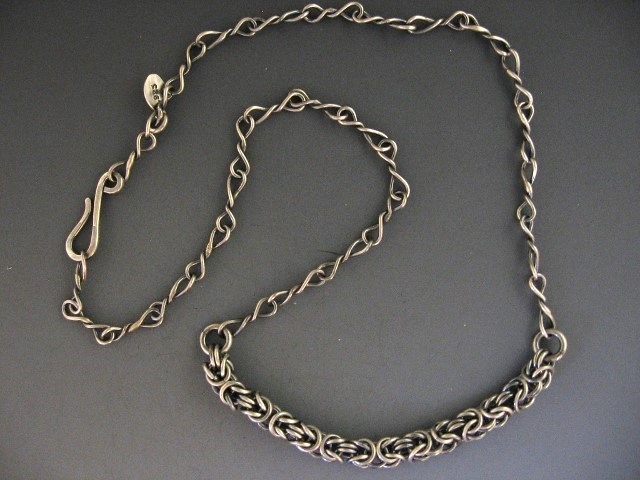 This is a light, versatile chain that may be worn alone or hung with a pendant. Measures 20" long. 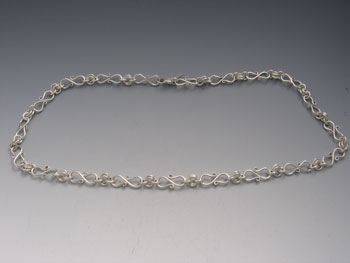 You'll feel the quality of this necklace in it's heft and smoothness in your hand. The classic sequential design is beautiful and timeless. Measures 17" long with a lobster clasp. Shown oxidized but may be ordered shiny also. A variation of the sequential chain, the foxtail is square or box-like. 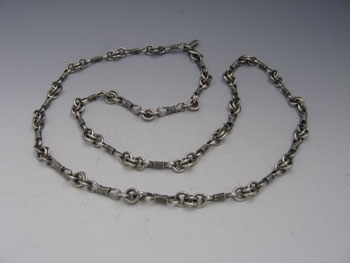 The chain shown measures 19" in length and just over 1/4" in width. 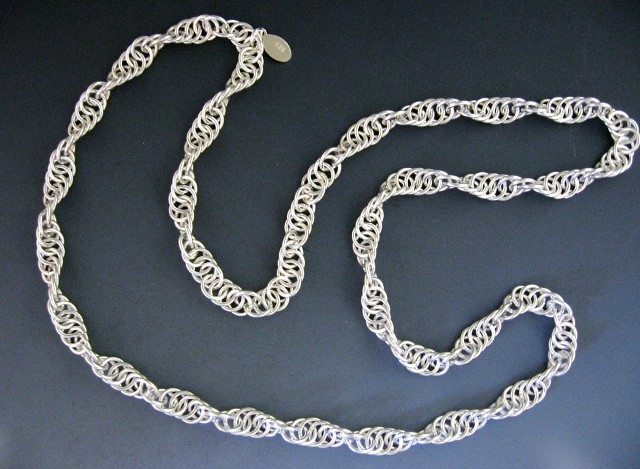 It's a very delicate looking but elegant chain that works best in dress up situations.